Entities are a specific type of data that is detected using natural language processing (NLP). You can now easily create custom entities that precisely match your use case and train the model with a single click. This ensures that the data that is copied from an email sent to a business case is always correct. 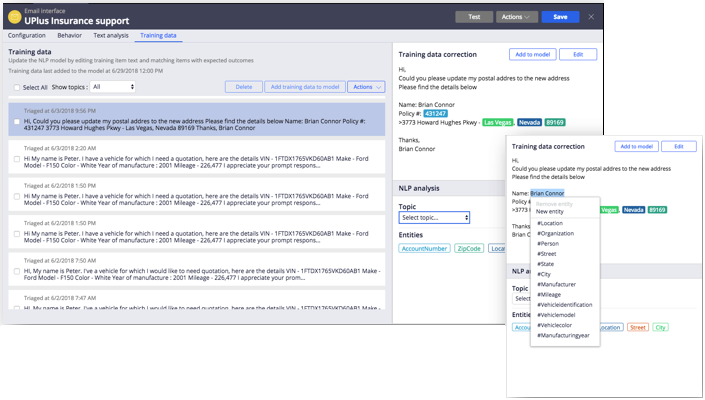 Creating custom entities and user-friendly model improves your ability to map data from a block of text into a Pega service case. This helps Pega Intelligent Virtual Assistant (IVA) for Email™ streamline email processing and reduce both the handle times and error rates. From the training data screen of Intelligent Virtual Assistant for Email, you can create entities and immediately correct any misidentified entities. You can then re-build the model and see those changes reflected immediately. For more information, see Updating entities for an Email channel and NLP model for an Email channel.